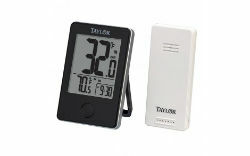 Thermometer offers uncompromising accuracy coupled with the benefit of a 200 ft. Wireless range. The unit itself has a stylish modern Veneer that works in any room, which puts no limit on the places where you can receive precise measurements. The thermometer can handle indoor temperatures between 32 degree and 122 Degree F or 0 degree and 50 degree c, as well as an outdoor range of -4 degree to 140 Degree F or -20 degree to 60 degree c. Further enhancing this unit's versatility and functionality is its built in clock.